Preheat the broiler (we had the oven rack on the middle shelf). Take a large skillet and pour one tablespoon of the olive oil in, setting the heat to medium-high. Once the oil’s hot, add in the mushrooms, seasoning them with salt and pepper afterwards. Stir the mushrooms around now and then for 5 minutes or until they’re lightly browned (we cooked them for 5 minutes). Take the skillet off the heat and leave it off to the side for now. Take a small bowl out and mix the ¼ cup oil and garlic together in it. Take a baking sheet out (we lined ours with aluminum foil) and place the bread on it cut-side up. Drizzle the garlic oil over both halves, sprinkling o salt to taste. Broil the bread for 2 to 3 minutes or until it’s lightly toasted (2 minutes did the job for us). Spoon the ricotta onto the bread, spreading it out evenly, topping it with the mushrooms and mozzarella afterwards (might not matter but between the two, we put the mushrooms on first). Stick the bread back in to broil for another 2 to 5 minutes or until the pizza is browned and bubbly (we went with 3 minutes*). Take the bread off the baking sheet and transfer it to a cutting board. 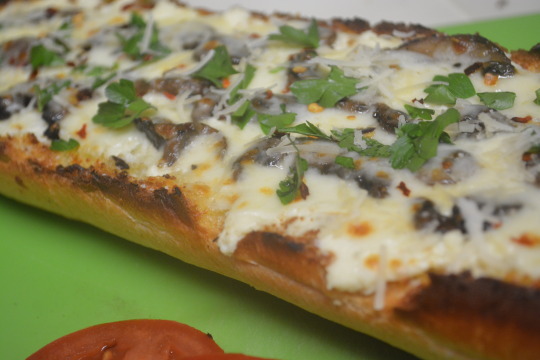 Slice the bread into pieces, topping with the parsley, parmesan, and however much red pepper flakes you desire. Take the tomato slices and drizzle them with the vinegar and the remaining tablespoon of olive oil, seasoning them to taste with salt and pepper. Serve the tomato slices with the pizza and enjoy ! Serves 4 (or two really hungry people). 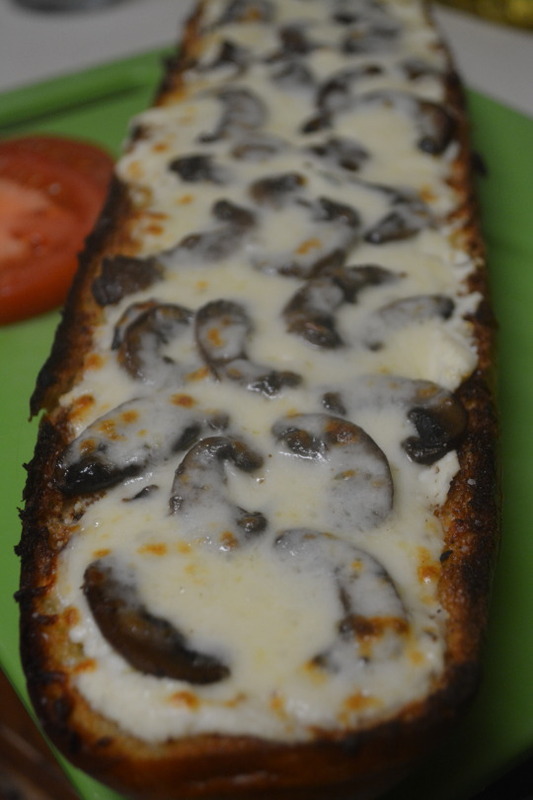 *At 3 minutes the cheese was nicely browned and bubbly but the ends and the edges of the bread were browned a little more than we would’ve liked so next time we’ll try just going for 2 ½ minutes. 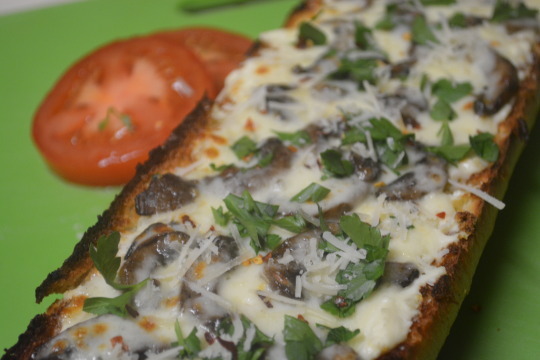 When you cook a pizza using a pre-made pizza crust, the crust can be limp or make you think “so this is what cardboard tastes like”, you won’t have to worry about that with this french bread pizza ! The outside of the bread had a nice crispy crunch to it and the cheese became ooey gooey. 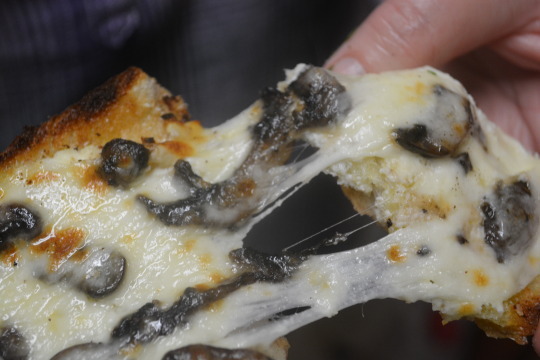 We love eating mushrooms so we’ll be at least doubling the amount of mushrooms next time. We couldn’t really taste the parsley but it did add a nice pop of color ! We added enough pepper flakes to make the pizza spicy which is a nice counterbalance to the salty (in a good way), cheesy awesomeness of this pizza ! We got this recipe from Food Network.